A recitalist organist, an active church musician and a composer who builds his works on tradition and his great predecessors, while making efforts to try to find his personal sound in his compositions, which are mainly written for request. András Gábor Virágh’s nicely unfolding career could be familiar to you as we have already reported some of the milestones of his professional career at our pages. 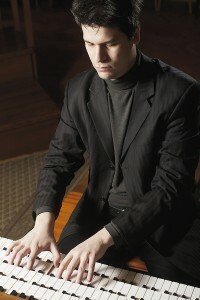 During last year, which brought many successes and achievements, perhaps the most prominent episode for him was that he became an assistant teacher at the Liszt Ferenc Academy of Music, where he teaches students mainly from the departments of composition, orchestral and choral conducting and organ, while he also provides lectures to students who study solfeggio and music theory as their primary course. – I felt privileged to see the level of confidence that had been placed in me. If I were to use a cliché, I could say that it is the peak of my teaching career. I am member of the Solfeggio and Music Theory Department and have to report directly to Miklós Mohay, composer and music theory professor. Based on his proposal and with the consent of both the Senate and the President, I was appointed to this position in September 2016. I was not new to the Academy for many people, because I used to be a part time teacher there with a schedule of teaching hours that accounted for a two-thirds teaching position. Of my colleagues at the Academy, I am pleased to mention some of my former professors, like Iván Madarász, who “infected” me with musical experiences during my high school years as well as Gyula Fekete, Head of the Composition Department, who was my composition professor during my academic years. Even though we are colleagues now, I still respect them as my masters. When I consult with them concerning a new piece that I am about to compose, they can give me useful advices that are worth including in the musical piece. Let’s stay on this subject for a while. Your composing work is increasingly strong-minded and focused. How can you cope with harmonizing all the elements required for the composing work, i.e. time management, in-depth thinking, ideas and inspiration with the rather strict church service? – Being an organist and composing music are activities that are present as two sovereign domains in my life even though these two spheres overlap at certain points. My experiences and feelings connected with playing a musical instrument create a wonderful source to use as a composer. I have to participate in many chamber music performances and similar works. During the rehearsals I come across countless phenomena that I can include in my compositions. On the other hand, the composer part of my character comes very handy when I am involved in liturgical organ playing, because during the church service ceremony soft background music needs to connect certain parts of the service. And you never know if a period that connects these parts will take two, four or even nine minutes. 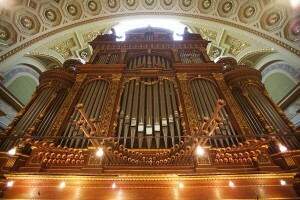 There are always a schedule of church service songs for each mass that provide the basis of themes and melodies, and the organist is actually “forced” to do some relevant improvisation. Being a composer makes it much easier for me to ensure that the improvised parts will be worthy of the church service. In addition to the skillfully crafted melodies of Hungarian music, I also have an affection for the Latin language-based prayers, based on which I have already composed several vocal works. I use Latin texts not only because I know them, but I also understand how easy it is to sing them, as I used to be a choir singer myself. Latin texts use a lot of vowels and have a relatively low amount of consonant congestions. Moreover, the ancient Latin prayers tend to be very expressive, lending themselves very well for musical formations. What is in your main focus? I ask this question in terms of themes, styles, forms, etc. – In my view, the two most important aspects of creating compositions is linked to the moto of Liszt Academy: “Patina and Progression”. It might be interpreted as tradition and innovation. It is essential for me to find my own musical language, the methods and ways through which I can express myself. At the same time, I would not want to deny what the musical traditions can offer for us. Innovation and progression must always rely on the integration of past experiences. I try to convey my messages such that my musical compositions will not make the listeners feel that this music was created fifty or even hundred years ago. Finding my own form of language in music is certainly a task I will have to pursue in my whole life. At this stage, I am interested in all of the typical music genres. I have already experimented with several fields; I created several soloist and chamber works, composed an opera and certainly wrote a number of symphony orchestra pieces. As to which of this genres will become my favorite is too early to predict. Perhaps I will know it by the age of fifty or sixty which genre can become part of me. I am in a fortunate situation that I continuously receive requests for new compositions. Normally they are absolutely different in terms of their genres and musical apparatus. Last year I was a resident artist of the Los Angeles-based Pacific Chorale, where I acted both as a composer and an organist. They performed O salutaris hostia, my composition written for mixed choir, and I also played some of my own organ compositions. In addition to the piece in which I accompanied the choir, I also played some of the traditional organ works of the organ repertoire at large. Last year saw many premiers, of which I would like to highlight the one where my symphony orchestra work, Sinfonietta was introduced. It was performed by Zuglói Filharmónia, conducted by Gergely Ménesi, at the Concert Hall of Müpa on October 9. In 2012, I wrote Les visages de la lune (Faces of the Moon), a piano suite in 4 movements, for Balázs Fülei. This piece was later published on Balázs’s solo CD (Enchanted by the moon, Hungaroton) at Christmas 2015. I have a relatively large number of works written for saxophone, each of which is linked to specific performers. I composed my first saxophone work in 2010 for alto saxophone and piano to satisfy the request of Seleljo-duo (Erzsébet Seleljo and Irén Seleljo). Since then alto saxophone has become my favorite woodwind instrument. Now I am actually composing a duet for a saxophonist who lives in Mexico City. On June 30, in Studio 6 of the public broadcaster Hungarian Radio, in Budapest, Gergely Matuz will introduce my Flute Concerto. Soon I am going to start composing this piece. This summer I will start working on my first ensemble piece to be written for a larger chamber orchestra. This request came from the organizers of Warsaw Autumn, a renowned international festival of contemporary music. Another work on my to do list is the Three Marys Song for soprano voice an organ to be premiered at autumn in Vienna. Also, the deadline for a requested trumpet-cello-piano chamber music work called Sonata da camera da camera is December 31. This will be premiered in the United Kingdom in the course of 2018. Recently you had a concert with your fellow composers and artists in the Solti Hall of Liszt Academy. What is the essence of the Studio 5 “formation”? – This is a new contemporary music platform, or you may even call it a creative workshop. Being teamed up with my colleagues, Máté Bella, Bence Kutrik, Szabolcs Mátyássy and Árpád Solti, our aim is to try to give close access to contemporary music for the public at large, with special focus on those who are younger than us, i.e. the so called generation “Z”. With slight exaggeration one could say that contemporary music has recently existed only among laboratory conditions and it completely distanced itself from the audience. At these concerts we would like to demonstrate that up-to-date works can be composed such that the audience will be able to relate to them. At our introductory night concert, on February 19, what the audience could here were compositions based on different musical, professional and humanistic approaches, but all of them were resting on the same foundations. These were fundamental musical idioms that are equally important for each of us such as forms, characters, rhythms, tones and instrumentation aspects. If we can find the right ways to exploit these distinctive features, we will largely facilitate the audience in their effort to try to follow the musical processes. In fact there are certain trends that were regarded fifty years ago as truly progressive and they denied the above idioms. However, by today all of these approaches became the traditional part of music history. We are all aware of these phenomena and understand how to use these features and techniques, but the way we try to integrate them in our own compositions should help the audience better adopt them. Our premiering composer’s night was a successful debut on February 19. All seats were sold out in the Solti Hall (former Small Hall) of Liszt Academy. The concert was recorded by the public broadcaster television and radio channel, and we are also honored to have received the request of the Liszt Academy to continue the concert series. We would like to establish a tradition by providing a concert always in February within the sacred walls of Liszt Academy. In addition to this, Studio 5 will certainly have more concerts at various other venues. Your first solo CD was also released last year. – The Masters and Followers CD was recorded in St. Stephen’s Basilica over the summer of 2016. This CD contains an assortment of 20th century works and some of my own compositions. 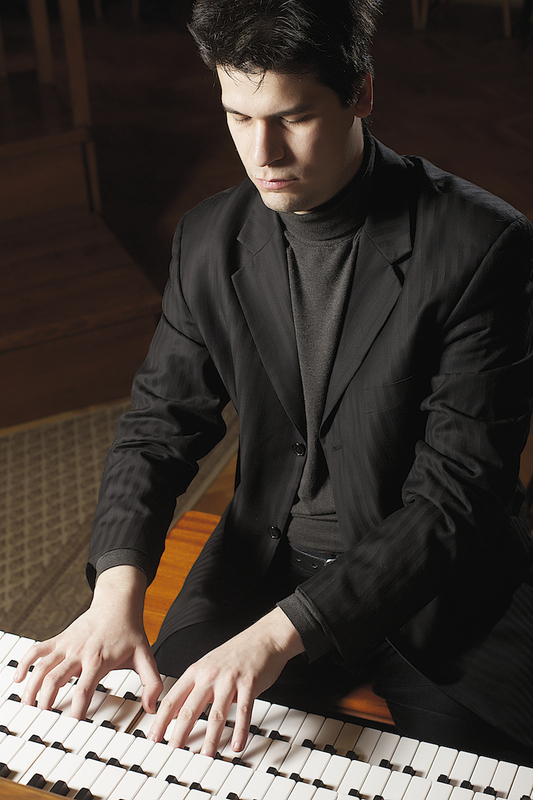 One of the master-follower line pursues the works of J. S. Bach. His most influential teacher was Buxtehude, while Vivaldi’s music helped Bach more deeply immerse in Italian music. The second leg of this musical string is related to the 20th century Hungarian organ works: I used two compositions of my own, through which I organized three opuses into a single bundle. These opuses are the works of István Koloss, Zsolt Gárdonyi and Zoltán Gárdonyi, respectively. Three of your works have been published. – Editio Musica Budapest published O sacrum convivium for women choir that was written for the request of the Béla Bartók International Choir Competition in Debrecen. My Capriccio written for marimba was published by Norsk Musikvorlag, the most prominent publishing house of percussion work publications in the Nordic region. Finally, Faces of the Moon, which was recorded by Balázs Fülei on his above mentioned CD, was published by the German Ostinato Musikverlag publishing house a few days before the Christmas holidays. I think I should be grateful to some outworldly powers for being able to realize so many professional and artistic achievements in 2016. Do you speak with your students about the “spiritual reality” of music that you have a chance to perceive quite often? – When I teach the works of a composer at the university, or when I play a piece of a particular organist, I try to introduce multiple faces of the artist. For example, when I teach Liszt’s Via Crucis, we certainly discuss with my students what needs to be observed in that part of the liturgical year. Furthermore, church music – in the best sense of the word and by using a popular contemporary expression – is “applied music” too. When I teach compositions related to Johann Sebastian Bach, the romantic era or the 20th century contemporary artists, I often bring my student groups to St. Stephen’s Basilica to play them a few organ pieces of the specific era. Frankly, I have thought about this “spiritual factor” many times. In my view an artist must believe in some sort of “spiritual power”, where personal interest can no longer have a role to play. I am convinced that our world and the various forms of arts cannot work without having beliefs. We must see something in front of us, which is better, more perfect, sets the target and the origin. It is a higher “power” that is unquestionably better than us, and we have to strive to reach out for it. This means that having a belief is essential to be able to pursue any advanced form of creative work.